Biting, nipping, and ‘mouthing’ (playing with an object – or your hand – gently with their mouth) are all common behaviors in dogs. Very often, they are part of a natural ‘playing’ instinct. Many breeds – for instance Cairn Terriers – will instinctively mouth your hand or their toys when they are playing. Nevertheless even non-aggressive biting behaviors such as these can be painful when you are playing with your dog. And, in general, you want to make sure that you have any biting completely under control – dealing with any tendencies to aggression right away, so that your dog does not become a biter. Below are three ways to train a dog not to bite. 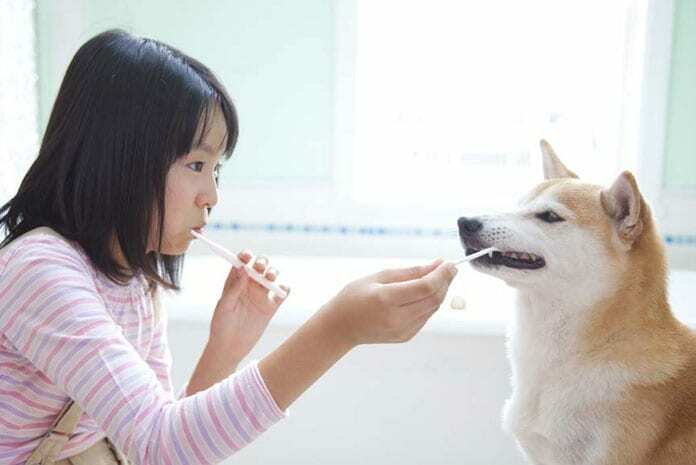 Though your dog may not pick up instantly that you want them to stop biting when you ask, if you repeat these methods whenever necessary and give your dog plenty of encouragement when they obey, they will soon realize that biting is bad. When you are playing with your dog and they mouth your hand (or your leg) too hard, simply let out a large, exaggerated yelp as if you are in great pain. Usually, your dog will instantly stop mouthing, as they will realize that they have done something to harm you. If your dog gets a little carried away when playing with you or other dogs, then another method that you can use is to give them some ‘time out’. That is, stop playing with them altogether if they start biting. You could do this simply by standing up and ignoring your dog as soon as they start to bite. Or, if you think they need it, you could gently take them by the collar and put them in a separate room for 5 to 10 minutes. You need to be firm but fair, and ensure that they know that it is because of the biting that they have had to stop playing. One way that you can cement this is their minds is to accompany the ‘time out’ with a command, like ‘no biting!’ said in a firm voice. As mentioned above, even dogs that do not mean to be aggressive will nip, bite and mouth in play. 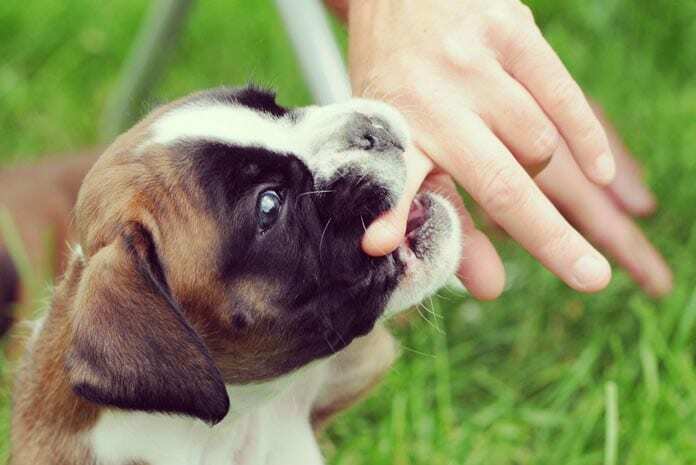 One way that you can turn their attention away from biting is to teach them to play in ways that do not involve biting at all, but which still allow them to use their mouths! A game of fetch or a game of tug of war with a long rope like toy are two ways to play with your dog in a way that does not encourage them to bite. 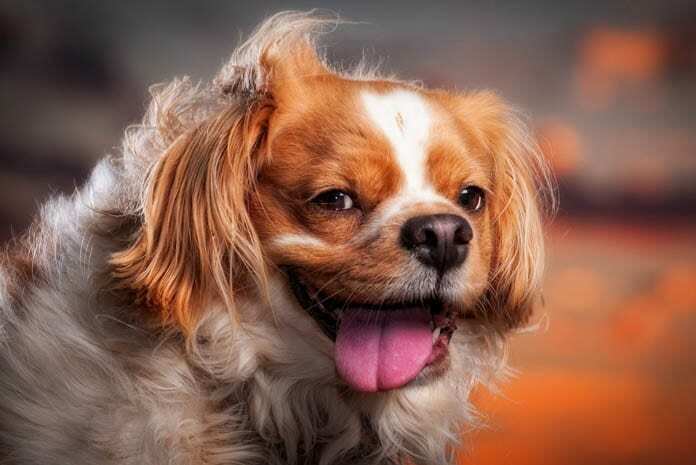 Finally, if you want to ensure that you can control your dog’s biting behaviors, then it is important that they have good levels of overall obedience. Teaching them to come when you call, to fetch their toys when you ask and to sit and stay at your command will instill healthy patterns of obedience in their minds that will make it easier to stop them biting.